​EARLY REGISTRATION EXTENDED TO NOVEMBER 30! Join GWA members for an unusual December event for holiday lights, greenery, goodies and more! Our day begins with learning about poinsettias and greenery trends during a special behind the scenes poinsettia painting demo and holiday swag workshop at K&W Greenery. Then, we’ll travel to Rotary Botanical Gardens for a hands-on workshop featuring plants of winter interest, a networking warm-up with holiday treats then a pruning demonstration sponsored by Proven Winners ColorChoice Shrubs. 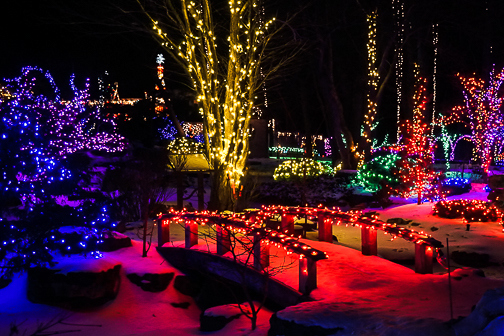 Then, the crème-de-la-crème: a guided tour of the beautiful Holiday Light Show at Rotary Botanical Gardens! Lunch NOT included with registration fee. If you wish to join the lunch, please RSVP to Diane Blazek at dblazek@aaswinners.com. Dinner as a group after the light show is optional, not included in the pricing, but we recommend The Milwaukee Grill (2601 Morse Street, Janesville, WI 53545). The group will meet at 12:25PM at K&W Greenery (1328 US-14, Janesville, WI 53545) then each of us will drive to Rotary in our own transportation. Cancelation requests received in writing by Thursday, November 29 will be subject to a 25% cancelation fee, which will be deducted from the refund. No refunds will be made after Thursday, November 29. Substitutions will be permitted with no penalties. Early registration ends on Nov 30, 2018. Regular registration starts on Dec 01, 2018 and ends on Dec 13, 2018.